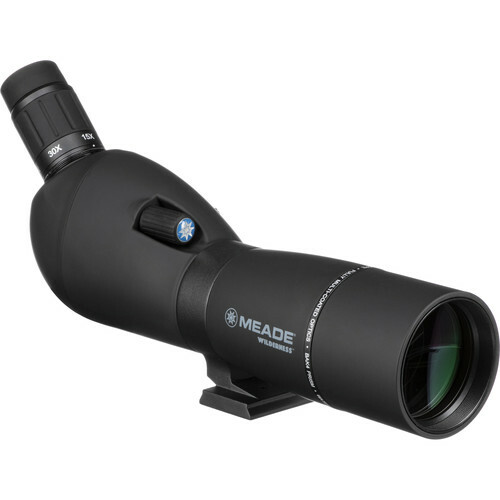 This 45° angled-viewing 15-45x65mm Wilderness Spotting Scope from Meade features fully multicoated optics and a 15-45x zoom magnification eyepiece that provide clear and bright images when viewing at mid to long range in all weather conditions. On the right side of the body is a fast-focus knob and on the left is a sight tube that runs parallel to the optical tube to aid in finding your subjects faster. The aluminum alloy housing is nitrogen-filled and o-ring sealed to be water and fogproof. It also has a rubber armored exterior that protects it from impacts. A digiscoping camera attachment is included that slides over the eyepiece, and accepts most user-supplied camera-specific T-mounts. Box Dimensions (LxWxH) 21.102 x 8.425 x 6.693"
15-45x65mm Wilderness Spotting Scope (Angled Viewing) is rated 4.8 out of 5 by 4. Rated 5 out of 5 by Terry from A really nice product for the price! I was really impressed with the quality look of the scope. It was more scope than I expected for the price. Optics were clear, workmanship great, Adjustments worked fine, I am very pleased. Only one thing I should mention is that at the BH website suggests the scope is rubber armored but it is not. It comes in a cheap soft cover but I would suggest finding a soft type cover like the one's Vortex makes for the Razor scope. However I bought a Razor fitted case (65mm) for the scope I am reviewing and it didn't fit the best. I suspect there is something out there that is a better fit and for less money than the Razor scope case. Rated 5 out of 5 by Chris Spera from What a nice Scope Great Value 10 times better than Redfield rampage. I was shocked how good the image quality is in a scope of this price on par with $$scopes you will like it. Rated 5 out of 5 by Dwight from Great "disposable" scope I live and work near some great birdwatching locations and wanted a scope that could be left in my car all the time. My 77mm Kowa is way too costly for that! The Meade Wilderness scope seems to fit the need quite well. It might not be fair to compare it with a scope that costs many time more, but here goes: The ergonomics are OK, but I prefer the Kowa. My hands are large enough that I can reach the focuser with either hand, but the knob should have been placed in the center rather than the side. Viewing is good when I take my glasses off. I haven't messed with the roll-up eye cups, but they sure aren't as nice as the screw-down cups found on more expensive scopes.? The case is OK. It can be left on while viewing, but the design makes it easier to take it off when viewing. 15-45x seems like a good range for a scope of this aperture. Excessive magnification would not be useful unless you get a bigger scope. Before giving my opinion of the optics, I should? say that I have only used it on rainy days so far. I might change my review after using the scope in better light ---? So far, I would say that sharpness is excellent at the wide end of the range and very good at the long end. I think the Kowa does a little better at the long end, but the difference is slight. Meade does very well and I have no complaints.? The Kowa goes up the 60x magnification, but it is a bigger scope. Meade makes some big scopes, but the economical models seem to get poor reviews from users. Perhaps 45x is approaching the limit of what can be done with cheep glass? All in all, I'm very happy with the Meade 15-45x65mm scope. I plan to leave it in my car all the time. It's just the right size to jam under my car seat and? it's light enough take it on some impromptu hikes.? I still plan to use the Kowa for planned outings, but probably won't miss it too badly when I stop at the marsh on my way home from work. The Meade will work well for me and anyone else who wants an affordable scope in this size range. Rated 4 out of 5 by Dwight from Update on the "disposable" scope I'm still liking it. I can use it with my glasses on if I remove the rubber eye cup. My Kowa has a wider field of view. The Meade is sharp at the wide end of the zoom range. The long end is less sharp, but still quite useable. It can not compete the better scopes that cost more money, but It is good enough to be useful and cheap enough to stay in my car all the time.